‘Norma’ is an operatic play by Vincenzo Bellini and librettist Felice Romani. It was first produced in Milan (26 December 1831), but is now brought to the small and cultural island of Gozo, in Aurora Theatre by the Gaulitana: A Festival of Music. The Aurora Theatre is one of the two theatre houses in Gozo. It is 40 years old and has played many great performances like ‘Cavalleria Rusticana’,’I Pagliacci’, ‘Madama Butterfly’ and of course ‘Norma’. It starts with greatly dramatic music, with the conductor (Colin Attard) being very enthusiastic and powerful with his moves. It is set to around 2,000 years ago with the Druids and the Romans, when Gaul was conquered by the Romans. Oroveso, the Arch-Druid (played by Gabriele Sagona- Bass) calls on Norma, the high-priestess of the Druids (played by Amarilli Nizza- Soprano) to cut the sacred mistletoe and the Gauls pray that their god, ‘Irminsul’, will inspire her to call for war. Norma’s lover, Pollione, the Roman proconsul in Gaul (Stefan Pop- Tenor) admits to his friend , Flavio (Filipo Micale- Tenor) that he loves the priestess in the grove of the Irminsul statue, Adalgisa (Anna Maria Chiuri- Mezzo-soprano) instead of Norma. And this leads to the dramatic and tragic plot of ‘Norma’. This was my first viewing of any operatic act and I found it very interesting. As a man that sat near me said, it is a great choice for someone’s first opera. I found the set and props of the Druid Temple and altar very realistic, with great lighting showing the difference between night and day. The music by the Malta Philharmonic Orchestra and the Gaulitanus Choir all conducted by Colin Attard started with a bang; all the tunes fit the scenes and movements very well, making the scenes more thrilling. The costumes were well made and fit the time period, but the wigs were a bit tattered. I could understand the plot line easily because it had surtitles to whatever they were singing in Italian. I enjoyed how all the performers did their part willingly and their expressions were very emotional. The performance started on time but finished a little later than meant to be, but no one in the audience seemed to mind and everyone looked as if they enjoyed it. This tragic and challenging piece by Vincenzo Bellini and Felice Romani was definitely well played by the singers and actors and of course the musicians. Romani had said that is was “the most beautiful rose in the garland” from all of his works with Bellini. I look forward, and I am sure many others too, to viewing more operas in the future which are brought to Gozo. 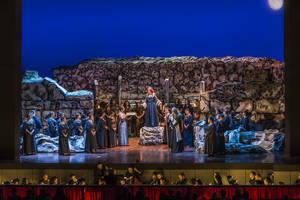 The opera Norma was presented as part of Gaulitana: A Festival of Music. The festival is supported by the Valletta 2018 Foundation.